With the impressive Great Ocean Tank or the picturesque Charleston Harbor as the backdrop, your celebration will leave a lasting impression. You and your guests will enjoy exquisite culinary selections from our exclusive catering partners as you are surrounded by colorful marine life. Panoramic waterfront views, remarkable animals and an exclusive downtown Charleston location create an unrivaled atmosphere. Venue allows outside food and beverage from preferred list. Founders Hall is a new and unique venue. It is located along the Ashley River, Charles Towne Landing State Historic Site which is known as the birth place of South Carolina. Founder's Hall is a historically significant venue that is resplendent with state-of-the-art features, it complements the natural beauty of Charles Towne Landing’s setting and offers guests every modern convenience, and including the capacity for 300 guests. This venue allows outside food and beverage. Between the historic white plantation home overlooking the Ashley River, and the expansive lawn and gardens that are perfect for a ceremony, Lowndes Grove Plantation provides the backdrop for a classic and romantic Southern wedding. The house showcases beautiful 1786-era architecture with period furnishings, an expansive piazza, grand lawn and sunlit terraces made of bluestone, brick and oyster tabby. This venue requires in-house food and beverage. The Rice Mill provides breathtaking waterfront views, historic property, and a well planned space, all tied together with perfect food and beverage options. The ground floor has classic design features including exposed brick, wide plank wood floors, large double windows, and pressed tin ceilings. The beautiful mahogany and marble bar is well suited for entertaining, while the adjacent dance floor area naturally lends itself to live music and dancing. This venue requires in-house food and beverage. The Island House sits on a private island on the banks of the Stono River. With stunning sunsets, a 180 degree view of the river, and a constant island breeze you can be assured to have your own little piece of the Lowcountry. The Island House is a private events venue on the Stono River, with a gorgeous view of our small marina. There are not many places in Charleston where you can get authentic waterfront pictures of your big day surrounded by the nature of the Lowcountry. Wingate Plantation represents the largest, undeveloped, intact parcel of the original plantation. The farmhouse on the property dates back to the 1930’s, when it was constructed by the Jenkins family. During the twentieth century, vegetables and small grains were produced on Wingate Plantation. Currently, the plantation is managed for timber and wildlife. The site has a 40×80 elegant wedding tent situated on the banks of a placid, saltwater pond. This venue allows outside food and beverage. Boone Hall Plantation was founded in 1681 when Englishman Major John Boone came to Charleston and established a lucrative plantation and gracious home on the banks of Wampacheone Creek. The majestic front lawn in front of the mansion, the intimate patio area behind, and the spacious back lawn flanked by gorgeous tidal marshes…create spectacular possibilities for a couple’s special day. This venue allows outside food and beverage from a preferred list. Harborside East is a water front venue located at the foot of the Arthur Ravenel Bridge. There are four unique waterfront options to choose from for your wedding ceremony. 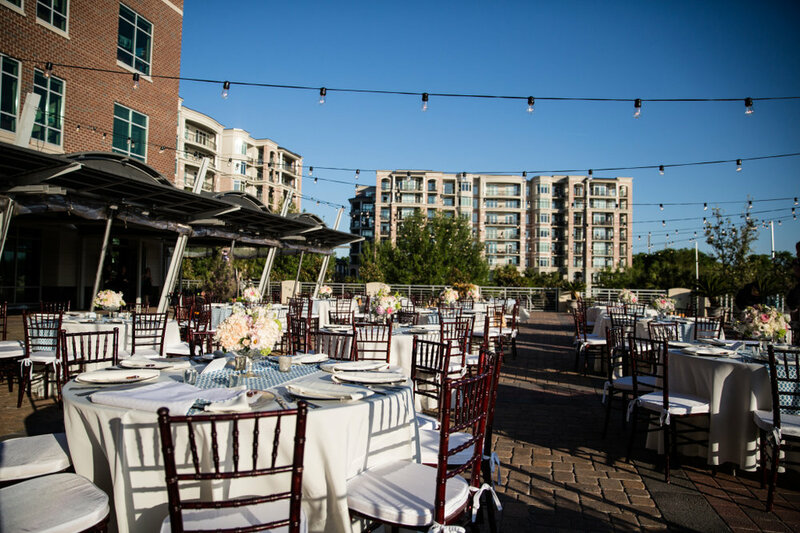 Harborside East venue offers a uniquely decorated and elegant interior. It also features a beautiful outdoor space that includes a partially covered patio but you also have the option to tent the entire patio. This venue requires in-house beverage but allows outside catering. Magnolia Plantation was founded in 1676 by the Drayton family, and has survived the centuries and witnessed the history of our nation unfold before it from the American Revolution through the Civil War and beyond. They offer four beautiful and unique locations, each with a different view, that are all full with breathtaking sights surrounded by live Oak Trees, the Ashley River, sweeping lawns and manicured gardens. This venue allows outside food and beverage. The Cedar Room at Mercantile and Mash, located in the celebrated Cigar Factory is an open and airy space, featuring historic wood columns, hardwood floors and original elements of the circa 1881 building. The 7,500 square foot venue can accommodate parties and celebrations of up to 550 guests. The space features a bridal suite, built-in bar, warming kitchen and a courtyard with additional event space. This venue requires in-house food and beverage. The historic William Aiken House is located in Downtown Charleston on the corner of King and Ann Street. The William Aiken House is a blend of 18th century charm and 21st century sophistication, which is both a romantic and urban way to tie the knot. With intimate outdoor space to dance the night away, and second-floor dining space, this venue sure gives guests a unique perspective of Charleston that cannot be replicated! This venue requires in-house food and beverage. Hotel Bennett will surpass your dreams of what a Charleston wedding can be. From the elegant ballroom and stunning outdoor wedding locations reflecting Charleston’s charm and elegance to the world-class overnight accommodations offered to your guests and bridal party, Hotel Bennett creates a wedding experience you have yet to imagine. Bridal showers at Afternoon Tea, spa pampering for the ladies, customized celebrations for the gentlemen. Let the hotel's wedding specialists assist with all of your wedding planning needs. With its waterfront location and unforgettable views, the Creek Club at I’On is a picturesque venue with over 5,000 square feet of space including wide, beautiful porches. The large lawn overlooking the creek and marsh is perfect for outdoor ceremonies or oyster roasts with a view. Beautifully landscaped with native foliage including live oaks, palms, and azaleas, the gardens are a sight to behold year-round. This venue requires in-house food and beverage. The Legare Waring House at Charles Towne Landing State Historic Site, Charleston's hidden gem, is unique not only for it's beauty but also for it's rich history. Ferdinanda Izlar Legare Backer Waring transformed the raw natural landscape into one of Charleston’s best-loved suburban gardens. It has hosted South Carolina's first families, national officials and international dignitaries...and is now host to a few lucky couples. This venue allows outside food and beverage. The outdoor venues at Middleton Place provide ideal venue locations. Estimated to be over 900 years old, with the Ashley River in the background, natural beauty of the ancient oak contrasts with the manicured gardens, it offers a site of uncommon magnificence. The Secret Gardens provide a more formal venue. Consisting of two separate gardens, the smaller of the two offers an intimate outdoor setting. This venue requires in-house beverage but allows outside catering from a preferred list. The Gadsden House is a grand Federal style Charleston manor, listed on the National Historic Register and celebrated as one of the top 10 historic properties to save and restore in Charleston. It saw decline in the mid 20th, but was saved from demolition in 1959 by the Historic Charleston Foundation as their first step in revitalizing the area. The final step in fully restoring the historic landmark is currently underway. This venue requires in-house beverage however allows outside catering. The Thomas Bennett House is full of architectural importance, and with a free-flying staircase that is only one of two in the entire city. The gracious interior of the house is extended and enhanced by a spacious piazza overlooking the garden. The garden is one of the most beautiful traditional gardens in Charleston, with a large brick courtyard and fountain, it is the perfect setting for distinctive and elegant functions. This venue allows outside food and beverage. The Gibbes Museum of Art is recognized among the oldest arts organizations in the United States. Home to the Carolina Art Association, established in 1858, the Gibbes has played a significant role in both enriching the aesthetic and cultural lives of its visitors and shaping the careers of American artists for over a century. The Gibbes Museum of Art is home to the foremost collection of American art that incorporates the story of Charleston. The Museum connects the city and region’s artistic past to a vibrant contemporary art scene. This is what we believe.